An Event to show respect , love , Tribute to the real life heroes of India , time to show them the we are with them , and thank them for the sacrifices done without expecting anything in return . Location : Behind ISKCON Temple & Goshala Ground, 1st Block, Kacharakanahalli Main Road, Venkateshpura, 1st Stage, HBR Layout, Bengaluru, Karnataka 560043 . 3K (Non Timed): Rs.550 (Includes Bib, Medal, Snack Box, Participation Certificates, T-Shirt, and Energy Drink). 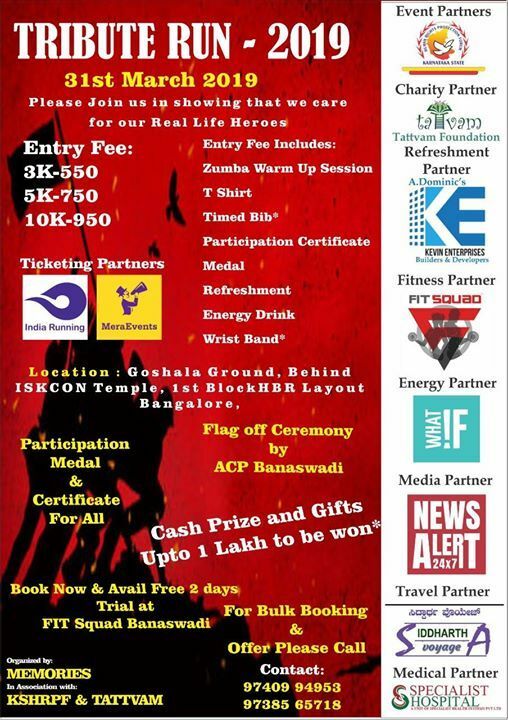 5K (Timed): Rs.750 (Includes Bib with Timing Chip, Medal, Snack Box and Participation Certificates, T-Shirt, Energy Drink, Wrist Band). 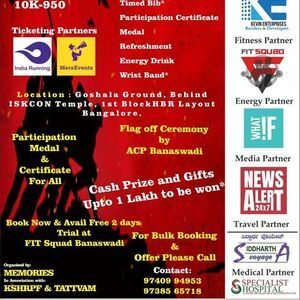 10K (Timed): Rs.950 (Includes Bib with Timing Chip, Medal, Snack Box and Participation Certificates, T-Shirt, Energy Drink, Wrist Band). Zumba Session Warm-up from 05:00AM to 05:15AM.